I’ve only been bragging about my mom’s peanut brittle for the past seven years. The reason I’ve never shared the recipe is that I’ve never understood how my mom made it so well. I’ve seen her do it about a million times, but I’ve always been so intimidated by the process. It looked dangerous and stressful. This year, I took more time to pay attention to the way she makes it, and it’s actually not so bad after all. I may even be able to attempt it on my own now. After sharing the videos of her making it, so many of you were asking for the recipe! She wrote it all out for me to share, and I’m excited to finally bring it to the blog! 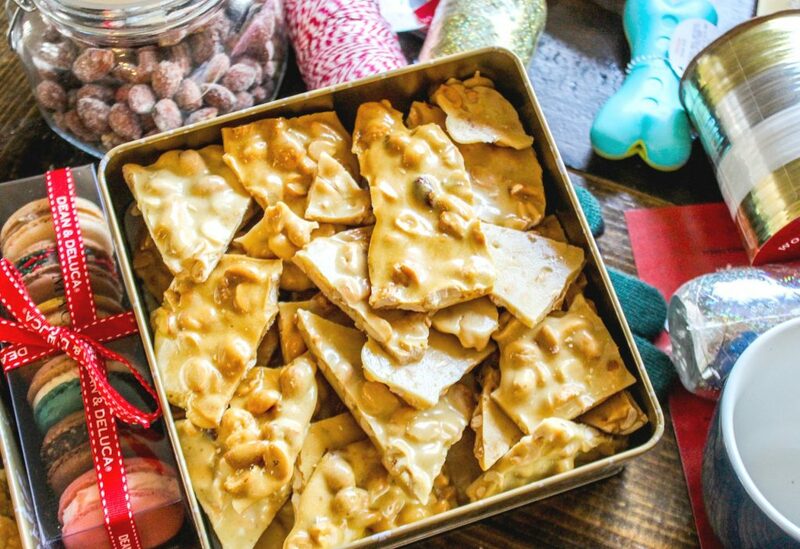 Since I was a little girl, the smells of peanut brittle always flooded the house around the holidays. My mom made it for family, friends, neighbors, coworkers, our teachers, and they always raved about it. I’ve tried many peanut brittle recipes from other people, but they’ve never stood a chance against my mom’s. You know how your mom’s meatloaf is always better than someone else’s mom’s meatloaf? Well, my mom’s peanut brittle is better than anyone’s mom’s peanut brittle. You just can’t top it. But the real OG is my grandma. She was the one that made it for years before my mom started making it. So, we also have her to thank! 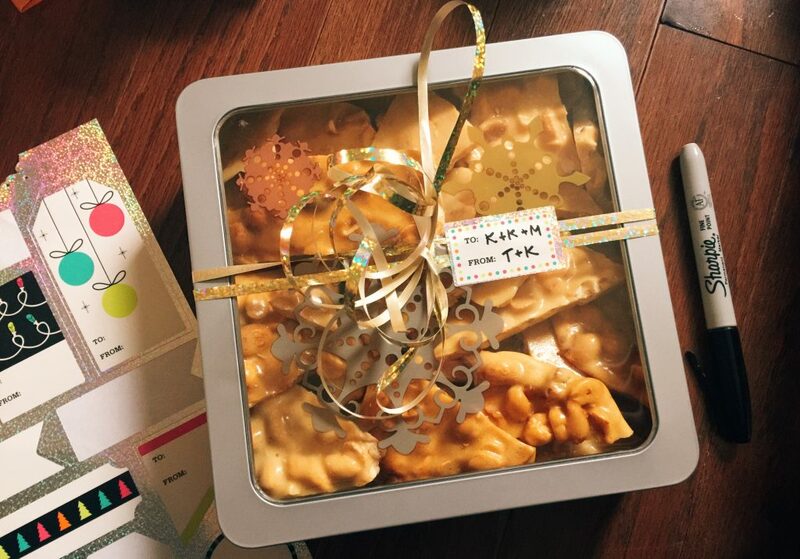 What I love about peanut brittle is that it’s so easy to pack, ship, and send! It has a long shelf life, it doesn’t get everywhere, and it doesn’t melt in packages. I make sure to ship peanut brittle every year. And who doesn’t love peanut brittle? You can safely send it to your gluten-free friends. 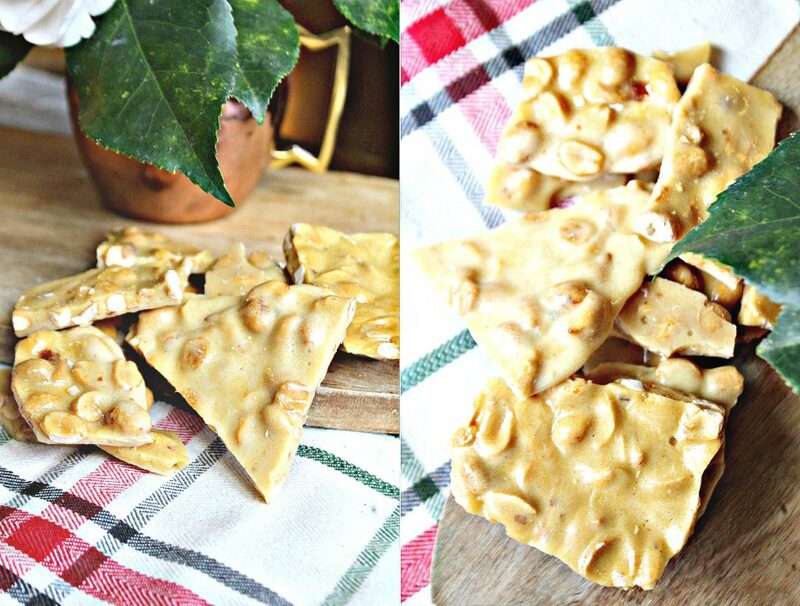 If you are on a budget during the holidays, making peanut brittle is a budget-friendly idea. 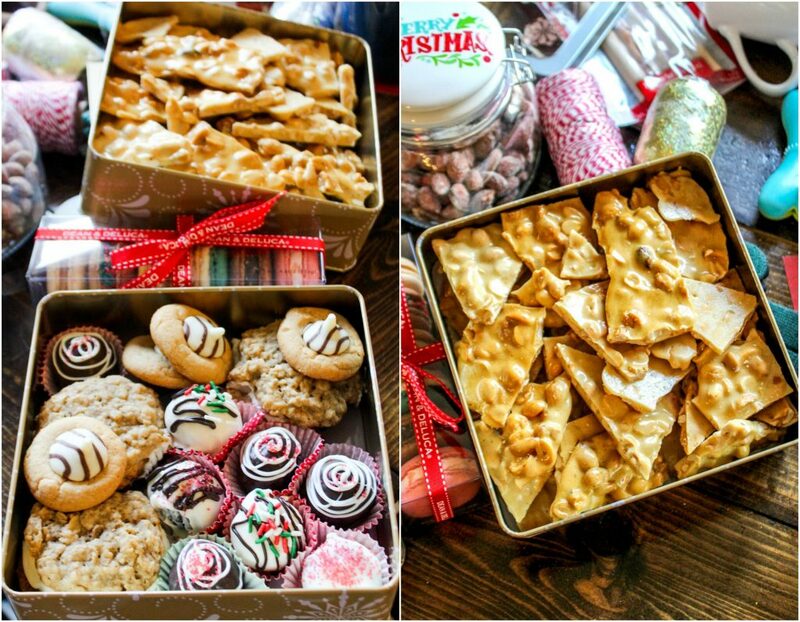 You can buy inexpensive tins from Hobby Lobby or Michaels, fill it with peanut brittle, wrap it with a bow, and it’s a gift under $7! Not to mention, it’s simple. If you made one for everyone on your list, you could finish all your gifting in a day. I was even thinking that I’d make about twenty boxes next year and send them out to some readers! 🙂 That could be fun. As you can see, it’s always made an appearance on our dessert table during the holidays. Those are all photos from the past four years. In a large pot on medium heat, stir the sugar, water, and corn syrup together. 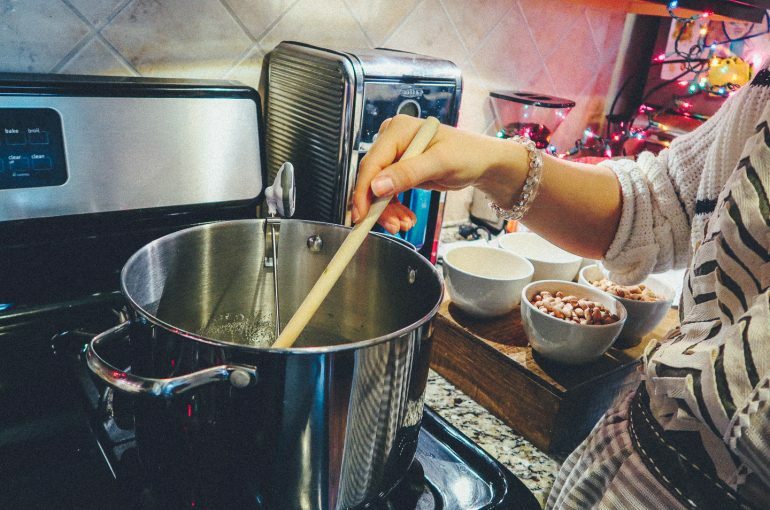 Continue to stir the mixture until your candy thermometer reads 235 degrees. Once the mixture reaches 235 degrees, stir in the nuts. Continue to stir until your thermometer reads 300 (softball stage). Turn off the heat and quickly add the butter, vanilla, salt, and baking soda. ***CAREFULLY*** Pour mixture onto the greased baking sheets and spread with a butter knife, or metal spoon. Remove the brittle from the pan, and cack it into pieces. Have you ever had peanut brittle? Have you ever made peanut brittle? 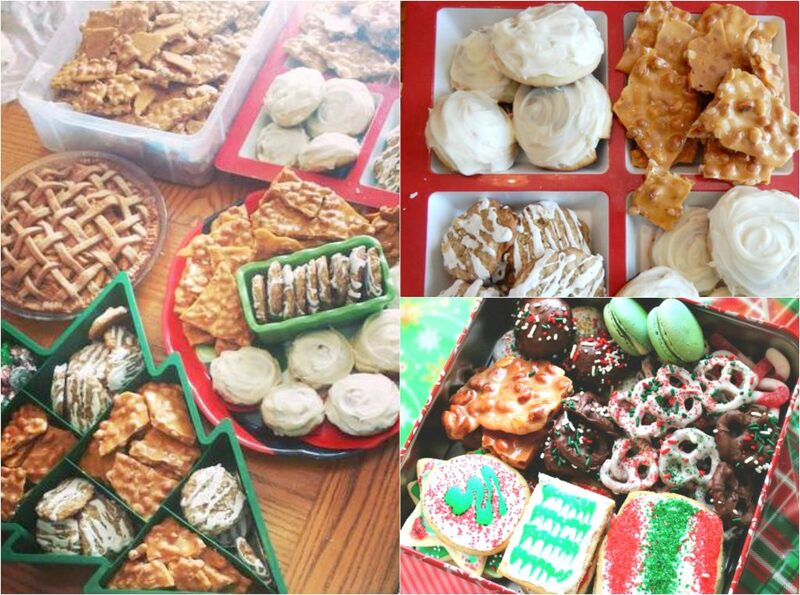 What is your Christmas dessert specialty? I’ve never had or made peanut brittle! No one in my family makes it so I guess that’s why I’ve never tried it, but it looks really good! My favorite thing to make around Christmas is peanut butter fudge, so good!! I can’t go near fudge. IT’S SO GOOD and my weakness. SO excited for this! One of my co-workers just brought peanut brittle this week and we snarfed it all down SO fast. I’m going to make this for our Christmas Eve shenanigans! Not going to lie, ANY dessert recipe that involves a candy thermometer 100% intimidates me (also the reason I’ve yet to make macarons). But I think I’m finally ready to go for it! 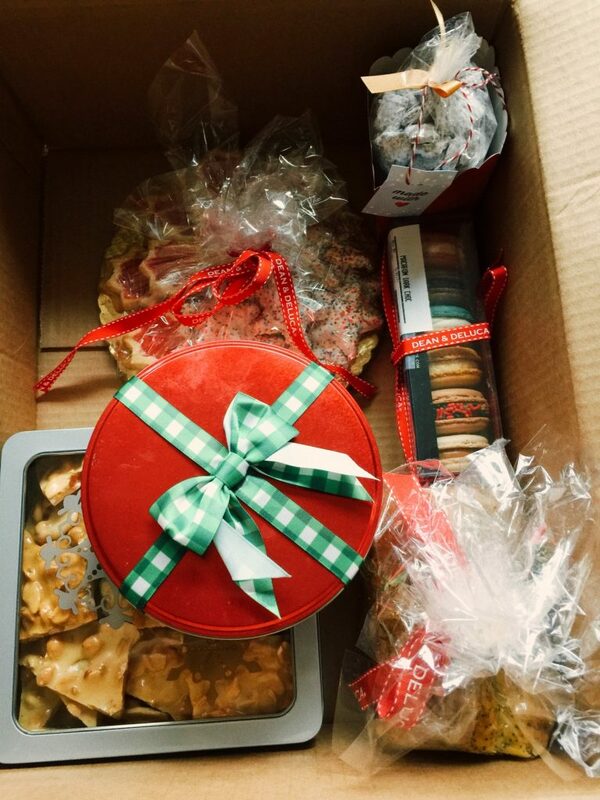 My Christmas dessert specialty is… eating all the Christmas desserts :). BUT, my mom makes a chocolate shortbread cookie that is to DIE for. It’s one thing that I remember from every Christmas I can remember! MMMMM that sounds so good!! I’ve had peanut brittle but I’ve never made peanut brittle. I think the secret ingredient is to have ROASTED peanuts than regular. 🙂 Roasted anything just brings out more of its flavour. My christmas speciality? Arts and crafts and singing christmas carols! Oh no. My mom says ONLY RAW!! LOL She wont’ do it with any other kind of peanuts! The peanut brittle looks delicious! I wonder if one could also make it with other nuts like cashews or almonds! (I used to be allergic to peanuts so I still don’t like the taste.) 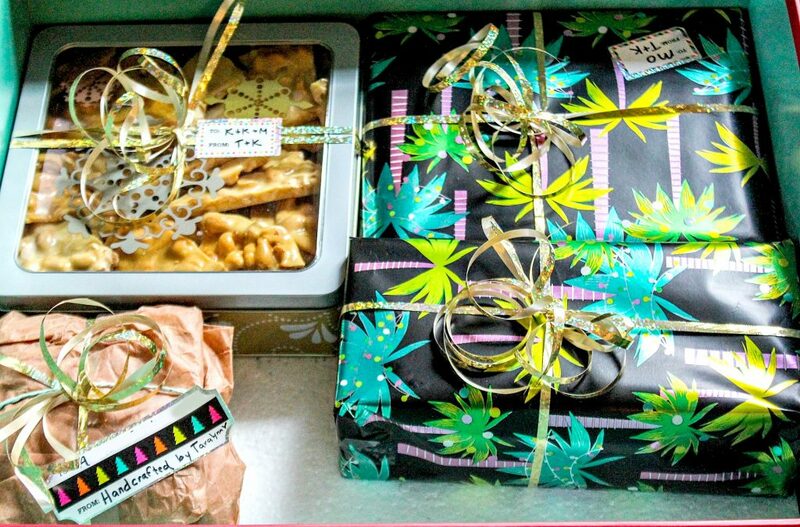 I love the idea of gifting others something homemade versus something bought. I know I’m always very appreciative of homemade gifts, since I know people are busy but still took the time out of their day to fix something for me. I love that! 🙂 Also, your mom and you look SO much alike! It’s incredible! I’ve never had peanut brittle nor have I made any! I’m behind on a lot of American traditional sweets, and just tried out fudge for the first time this year. (Not sure if it counts though, as it came from a gas station.) 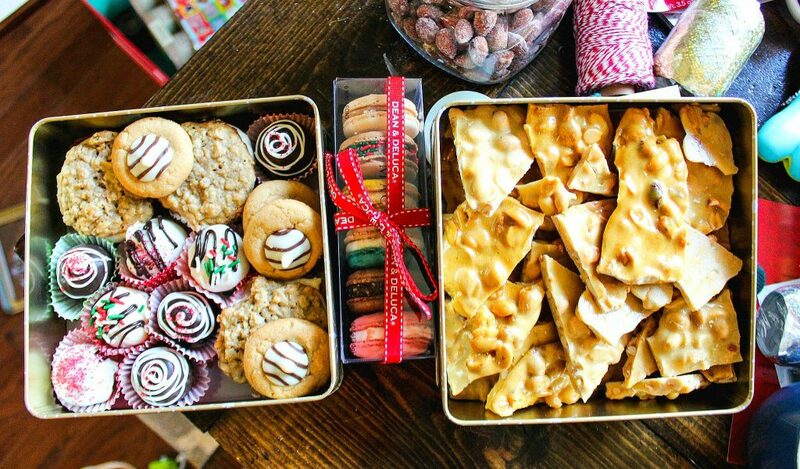 My family’s Christmas staple in the sweets departments are cookies. For the past two or three years I’ve always made the easiest gluten free almond-raspberry thumbprints, and before that my grandmother would always make the most delicious cookies EVER! My favorite were her orange marmalade tower cookies. They’re a German specialty and it had orange zest in it, which made it so flavorful! 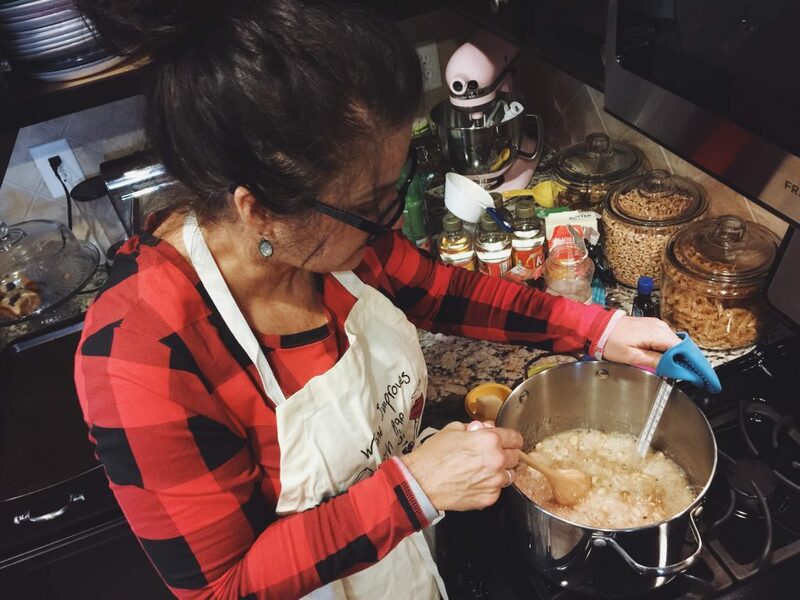 Thank you to you and your mom for sharing the recipe! You can! 😀 Some people don’t even add nuts! You had fudge for the first time?????? how??? LOL gas station fudge isn’t as great as homemade, but it’s fudge. MMmmmm those cookies sound amazing! Yum! This is my mom’s favorite sweet, looks like I’ll know what I’ll be doing this afternoon! Ahhhhh let me know what you think! I am so glad you posted this! I can’t wait to give it a whirl over Christmas break! Love me some peanut brittle!!! Made it this afternoon and it is addicting and delicious. My boyfriend was laughing at me because of how fast I was stirring! Hahaha that is too funny:D Glad you enjoyed !